Photos and snippet of footage available on request. Two activists from group Agitartworks dressed as GCM Resources executives kicked over a makeshift hut and covered a woman in coal as part of a street theatre outside the door. Police arrested them for breach of the peace but released them shortly after the demonstration. At the same time inside the AGM an activist dressed as Santa from Climate Justice Collective gave a stocking full of coal to the company chairman saying, “Ho, ho, ho, have you been naughty or nice this year? This year you threatened to evict 220,000 people so you could profit from polluting the climate. St Nick always knows – your stocking’s full of coal!” The meeting was quickly broken up following the intervention from Santa. During the AGM, activists from the Bangladeshi community and other organisations including World Development Movement and London Mining Network asking numerous questions about the highly contentious Phulbari project and its massive human rights impacts. In 2006 three people were killed and over 200 injured when paramilitary troops fired on a protest of some 80,000 demonstrators in Phulbari. If completed, it has been estimated that the project would destroy the homes, lands, and water sources of as many as 220,000 people, and forcibly evict an estimated 130,000 people. Miner GCM Resources is the subject of a complaint to the Organisation for Co-operation and Development over the controversial coal mine. Emails obtained under the Freedom of Information Act show the company also requested help to push the project forward from UK Trade & Investment. GCM Resources plc, an AIM-listed UK-based multinational company, is moving to implement the project despite the human rights and environmental concerns that have been raised. The situation in Phulbari has been volatile since 22 Nov, 2012 when a 48 hour general strike halted trains, blockaded highways, and closed all shops, educational institutions etc. National press in Bangladesh reported that security forces including about 500 police, Rapid Action Battalion forces (denounced as “a death squad” by Human Rights Watch), and members of the Bangladeshi border guard have been deployed to Phulbari. The OECD Complaint As a multinational enterprise operating in an OECD adhering country, GCM is obliged to avoid infringing on the human rights of others, and avoid causing or contributing to adverse human rights impacts in the context of its activities. 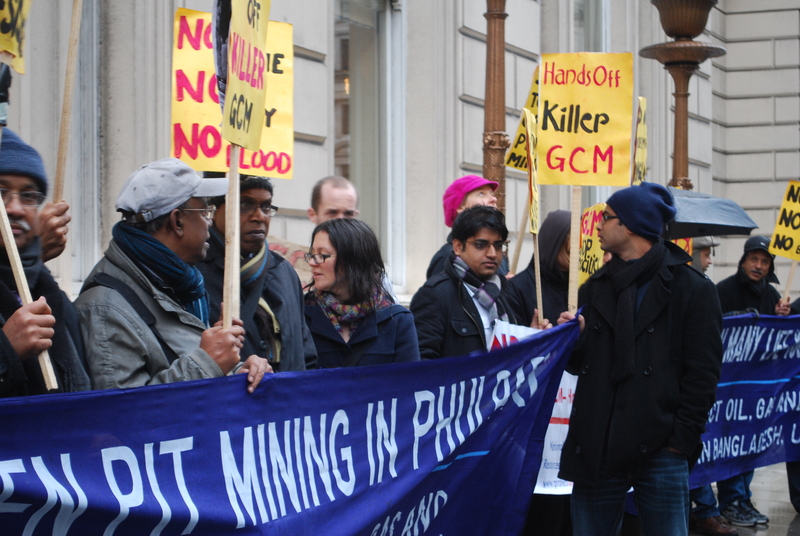 In breach of these guidelines, GCM’s continuing efforts to force its proposed Phulbari Coal Project forward in the face of massive and sustained opposition involving tens or hundreds of thousands of Bangladeshi citizens have already resulted in severe violations of fundamental human rights, including the right to life, liberty, and security of person. If allowed to move forward as planned, GCM’s Phulbari Coal Project threatens to violate fundamental human rights recognized in an international framework of human rights that includes the Universal Declaration on Human Rights (UDHR), the International Covenant on Economic, Social and Cultural Rights (ICESCR), the International Covenant on Civil and Political Rights (ICCPR), and the UN Declaration on the Rights of Indigenous Peoples (UNDRIP), as well as the Equator Principles, which GCM claims it will uphold in implementing this project. GCM and Phulbari GCM’s proposed project would excavate an open pit coal mine in the township of Phulbari, located in the district of Dinajpur in northwest Bangladesh. Project plans call for the mine to extract 572 million tons of coals from a series of 1,000-foot deep pits spanning a total area of over 14,500 acres. In addition to the mine, the project would: construct at least one 500 Mega Watt coal-fired power plant; construct one new rail corridor and realign an existing portion of railway; construct one new road and realign two existing roads; and divert two rivers in an effort to mitigate impacts of mining operations in reducing access to water. The mine would have a projected lifespan of at least 36 years and extract 16 million tons of coal annually at peak production. One-fifth of the coal would remain in Bangladesh and be used for domestic energy consumption, with the remainder slated for export.